Knitted Kakapo with Gemma Sound pack #WearableWednesday @gemzina « Adafruit Industries – Makers, hackers, artists, designers and engineers! Nice build from @gemzina on twitter! Snag the pattern here. GEMMA Talking Toy Guts Sound Pack: Mod your stuffed toy to chirp, meow, or woof! 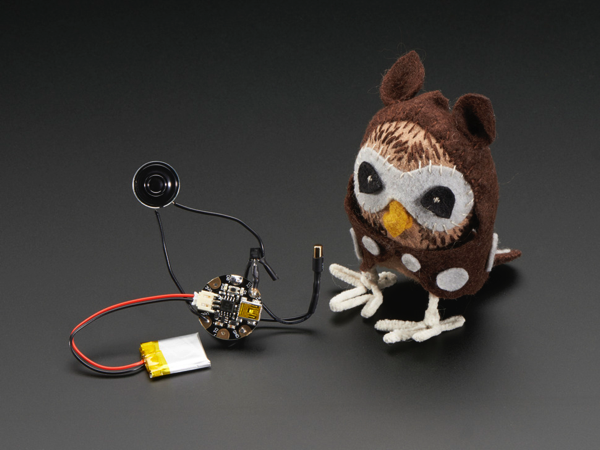 This GEMMA parts pack makes it easy to add simple sounds to any plush toy, and especially the Sew-Your-Own Owl Kit (not included!) A tilt ball switch is used to trigger GEMMA to play a sound of your choosing (or write your own) through a small speaker, amplified by a transistor. Read more.